As part of a family vacation, I had some really grand plans to cycle the Cabot Trail. The plan was to split it into 3 days of riding. I would bike each leg, while my family would drive (and take all of my stuff with them). Problem #1 - my wife hated driving the Cabot Trail. Like really, really hated it. It's curvy, pretty narrow, and she almost went off the road (with my kids in the van). Problem #2 - the weather went from lovely on Day 1 to pouring rain that evening and for all of days 2 and 3. Problem #3 - road construction was crazy - long stretches on mountain roads of gravel (which in the rain was a disgusting mess). Long story short, I only biked on Day 1, and drove the rest, enjoying all that the Cabot Trail has to offer from the warmth and dryness of the family minivan. I started out mid-day in Baddeck. There is a small stretch along the Trans Canada that people had warned me was busy with highway traffic, but the shoulder was wide and it didn't strike me as particularly dangerous. At the big Red Barn the Cabot Trail adventure truly begins. First is the big climb of the day - Hunter's Mountain. It was a bit tough, but nothing compared to what Day 2 brings... I did OK on it, but already was questioning my sanity a little. After that there's a great descent, which was welcome but unwelcome - for every down, there's inevitably some up, and this was no exception. Most of the day was spent going up or down, nothing too serious and generally a pleasant ride. 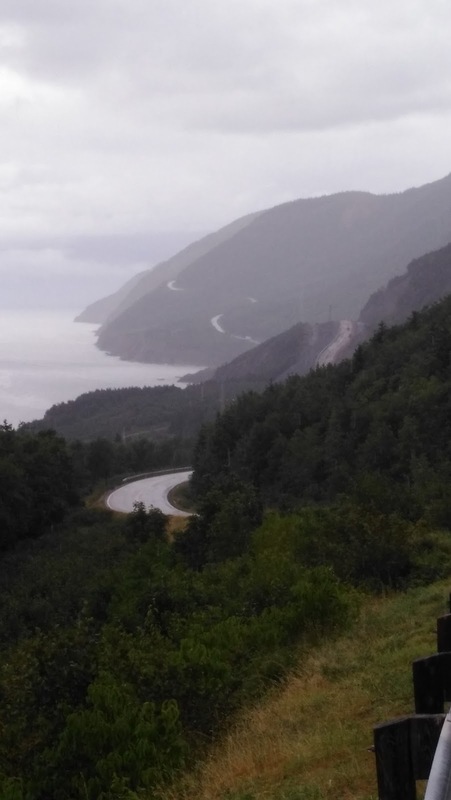 There is one decision to make at about kilometer 50 - you can either go with Cabot Trail or use East Margaree Road. I went with the later as suggested by this website, It was a quiet road, although quite broken up in spots (but I was able to use smooth parts of it, motorists gave me lots of room generally). Finally at about 65km in you break out into the ocean view. I was very lucky to get a wicked tailwind from there to Cheticamp! It was glorious. The views are stunning. Simply amazing. Like I said, I ended up driving this section, but wow those climbs are solid challenges. Long and curvy, some very steep sections. I really want to go back someday and give it a go. The final significant climb on this section is not as high as the others, but I'd imagine by day 3 it's a leg buster. Again, I drove, so.... I'm sucky. We passed some cyclists clearly on an organized tour sticking it out. They were climbing in the pelting rain, looking like they wanted to die. I'm sure they appreciated their accomplishment by the end, but in the moment... well we've all been there! The roads are narrow and very little shoulder to speak of most of the route. I wouldn't say this is the safest place to bike... I had a few people pass me at pretty questionable times (ie. when they couldn't see around the corner we were arriving at!). But mostly the cars were considerate and good. One thing I would have likely regretted if I'd ridden it was missing all the stops along the way - there were a lot of places to snap a picture, go for a hike, hit a small local shop, etc. If you're putting in big miles it's pretty unlikely you'd get a chance to stop and smell the roses. But you could always spend an extra day and drive the whole thing too! I would like to go back and do it someday, without forcing my poor wife to drive. And hopefully without the rain.